Papers Past Spedderi and Dougherty. Advertisement in Mt. 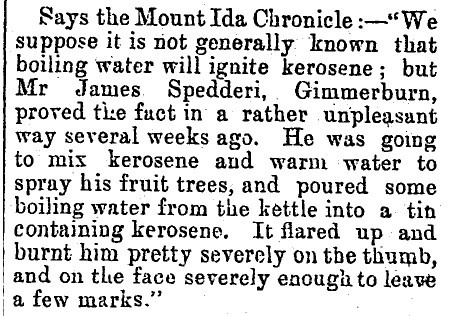 Ida Chronicle after James Spedderi had sold this hotel to Mr George Chapman in 1867. 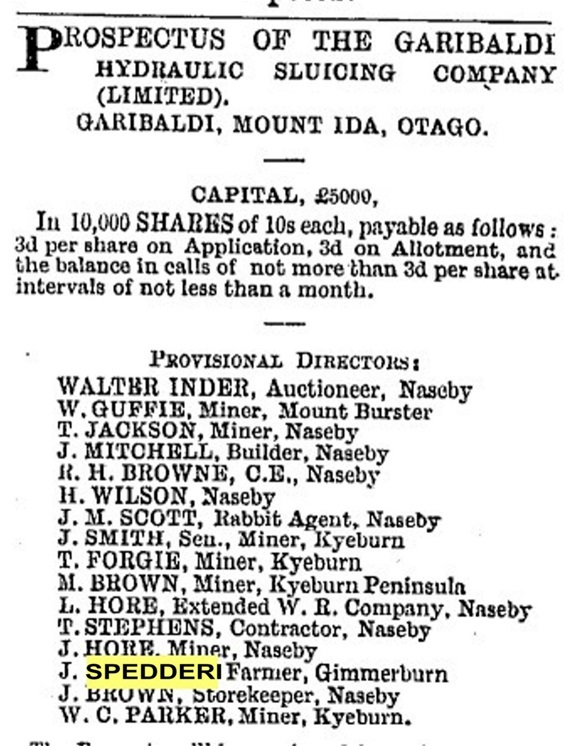 In 1865 around 500 people lived in Naseby, 70% were miners 10% were hoteliers. Leven Street Naseby towards Ranfurly. Kyeburn Hotel oposite Bank New South Wales. 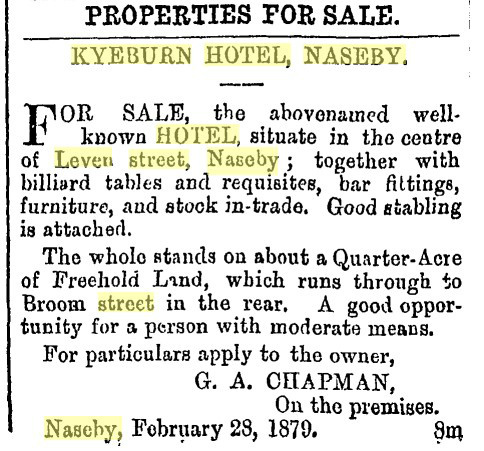 Mt G.A.Chapman puts up for sale the Kyeburn Hotel in 1879. Mt. Ida electoral roll 1800 -1881. James was a miner of Garibaldi. Gimmerburn coal mine. Charles Dougherty in partnership with R. Little. Ellen Spedderi drew this land in a ballot in 1894 and gave them to her sister Rosina. This article was in news papers around New Zealand. This is Caldwells application for a lisence for the Wedderburn Hotel. Mary Spedderi married James Caldwell. Mary and James Caldwell's Crown Hotel in Wedderburn. 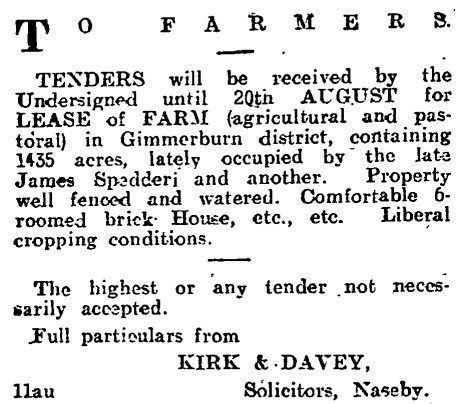 The first owner Mr Cavadore tranferred the lisence to James on the 20th April 1888. The Caldwells occupied the hotel until it was transferred to George Searle on 25th July 1900. In 1900 the hotel Loves Hotel it had been situated in Eden Creek built in the 1860's. It became known as Woodney's hotel soon after. The hotel was sold to Dominick Geoffrey around 1879. It was shifted to where Adamsons apiaries is situated, In 1900 the hotel was sold to Mr Ben Monk who shortly sold it to James Caldwell who had ownded the rival hotel The Crown Hotel. 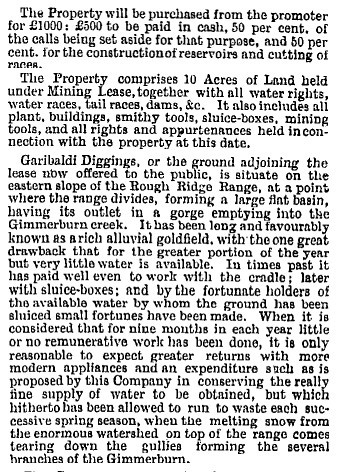 James removed the lisence to Rough Ridge (Oturehua) in readiness for the arrival of the railway there. Rough Ridge opened a Home school in 1880. Maruimato (White Sow Valley Wedderburn) school commitee 1898. Mrs Mary Caldwell daughter of Bridget and James sister to Larry, Ellen and Rose, giving stamps for the missions. James Caldwell applying for an accommodation lisence. 1901. 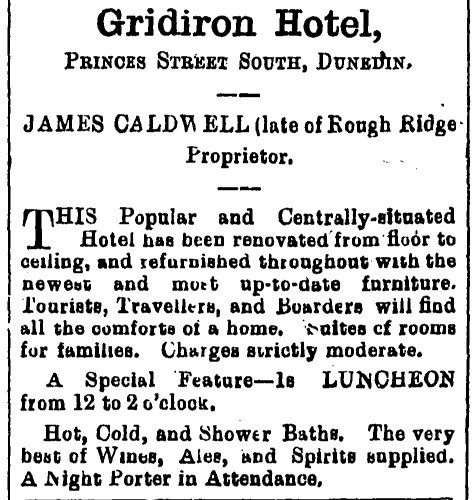 The Caldwells had moved on to Dunedin by this. 1903. 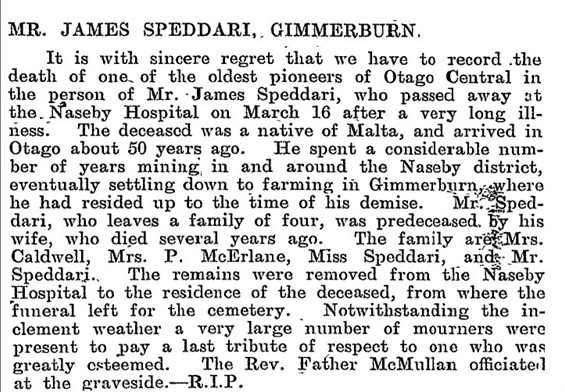 James Spedderi Death Notice in the New Zealand Tablet April 1909. 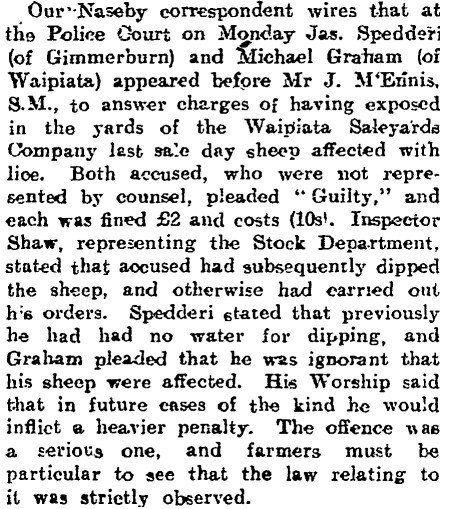 From the New Zealand Tablet 1st April 1909. The Tablet didn't get the spelling right either. 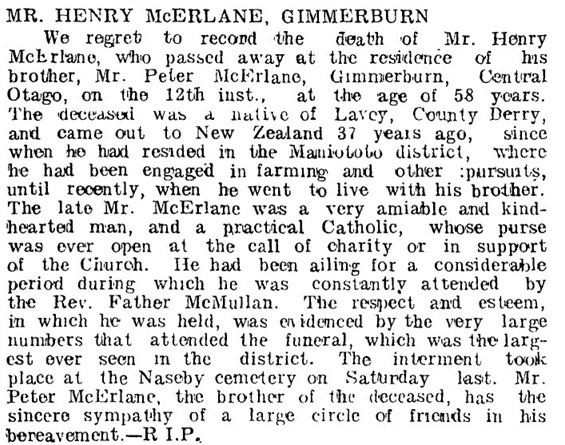 Obituary from the tablet 1905 of Henry McErlane brother and brother inlaw to Rose Ann and Peter McErlane. The first anniversary of James Caldwell's death this inserted in the Otago Witness in 1908 by his wife Mary nee Spedderi. 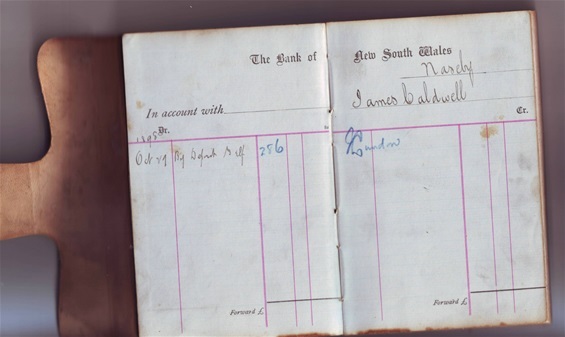 James Cadwell's Bank Book 1898 was that money he deposited for a trip to London?? Death notice of Mary Ann daughter of Mary Spedderi and James Caldwell. Wife of Edward James Ball. She died aged 27. Mary Spedderi and James Caldwells daughter and wife of Edward James Ball. He joined the N.Z. Army for a while and them went home to England after her death. 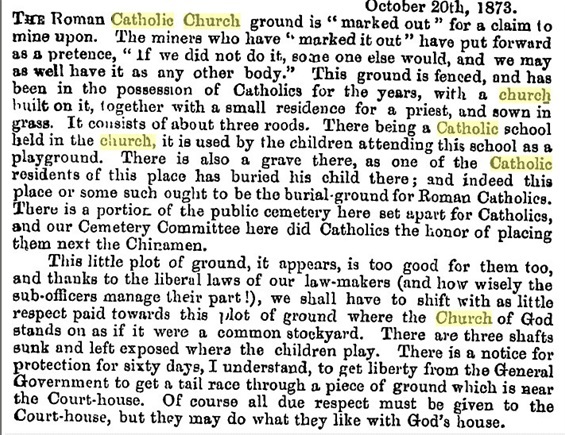 I wonder who the child is buried in the first catholic church yard in Naseby N.Z..